These look delicious! Congrats on a successful recipe. I'll definitely have to try these. 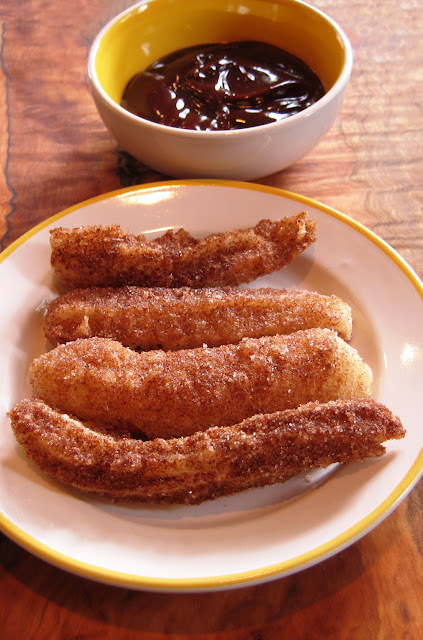 My family will love these - churros was one that I wanted to try when I saw what we were doing. I will try soon! ooo... i'm making these this weekend. and the chocolate too! Ok, so I was planning on making some more choux tomorrow, to fry up in honor of National Donut Day, but realized I'm out of eggs and wasn't planning on going to the store. I was feeling disappointed until I realized that your churro recipe is vegan - no eggs needed! Hurray and thank you! Ooh. I soooooo want these!